I am sure my kids are too old for a Easter Egg Hunt but I will not give it up yet. 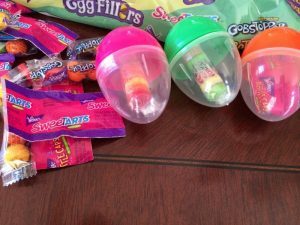 Thanks to the folks from Nestle for supplying me wiht an array for Easter Candy to write this post about Easter Egg hunt Ideas. I was only provided with product and all the opinions expressed are 100% my own. Moms love celebrating Easter traditions and planning Easter Egg hunts with the sweet treats that their family looks forward to every Easter. No Easter get together is complete without new and time-honored recipes. Add a little surprise to this year’s festivities with the Easter Brown Cupcake, Coconut Nests or Chocolate Chip Easter Baskets. For our Easter Egg Hunt I decided to use my Crunch NestEggs and make these Easter brownie bites to create an edible Easter Centerpiece. 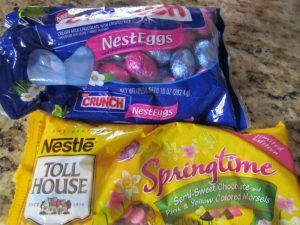 Using a Brownie box mix, I added 1/2 cup of Nestle Spring Chips and 1/2 cup chopped up Crunch NestEggs to the batter and spooned into mini muffin pans. Bake for about 12 minutes. 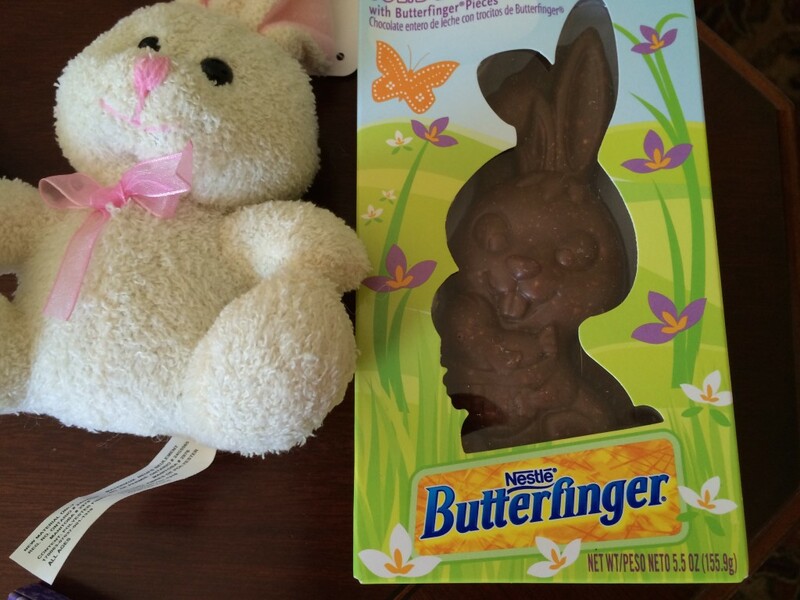 Kids will enjoy the extra Crunch in this Easter treat. 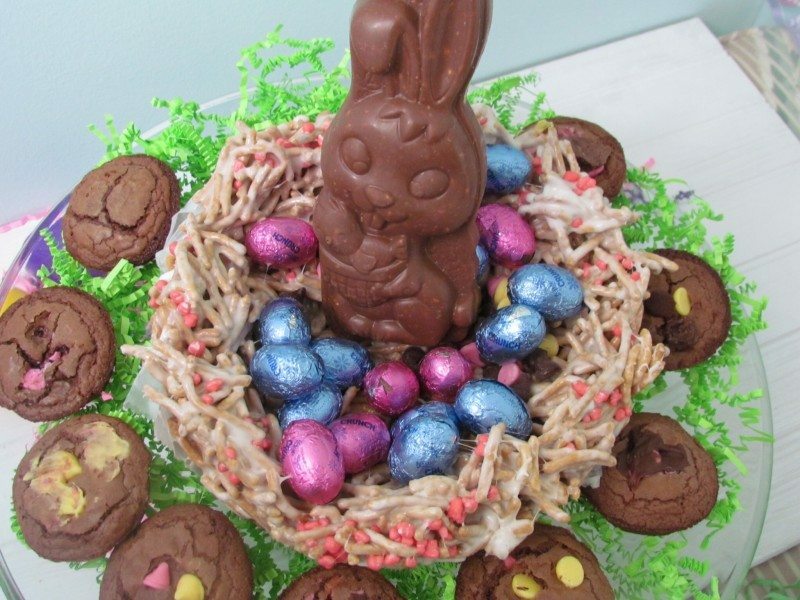 To make the edible Easter Centerpiece I made a large nest out of Chow mein noodles. 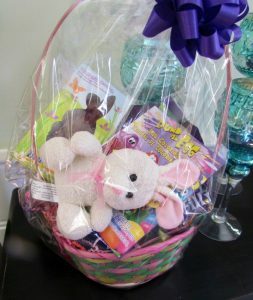 Follow the basic directions for these easter party favors but use a large sprayed bowl to mold the large nest. I also added some NERDS for a festive and flavorful touch. Allow to cool completely than carefully transfer to a platter. Fill the nest with your favorite Nestle Chocolates and display your Brownie bites around the platter. You now have the perfect Easter Egg Hunt centerpiece. Here is an aerial view of this edible Easter Egg Hunt Centerpiece. Easter is also about the opportunity to spend time with loved ones and making memories. Moms want to give their family and friends the very best without breaking their budget. 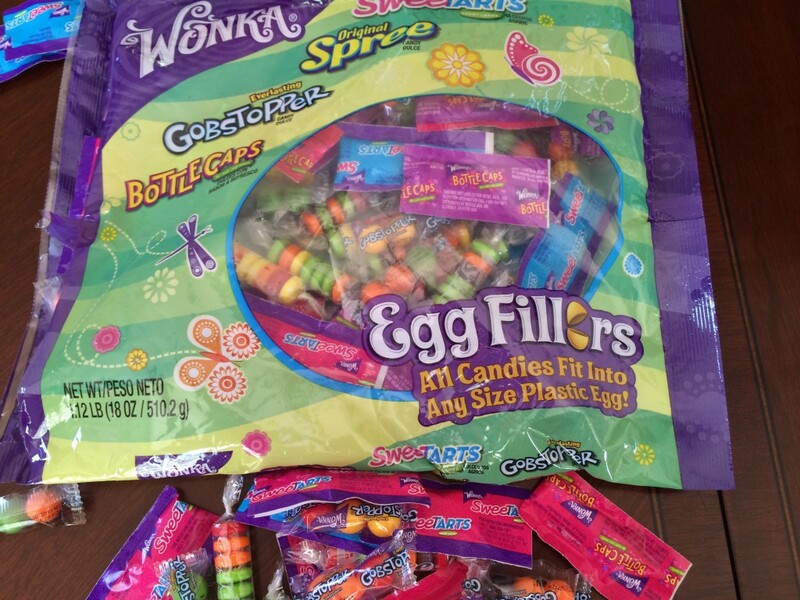 With Nestle Seasonal candy, moms can bring a smile to their child’s face with an Easter basket filled with their favorite items such as the Nestlé Crunch Bunny or NERDS Bumpy Jelly Beans, WONKA Laffy Taffy Jelly Butterfinger NestEggs and Crunch NestEggs. 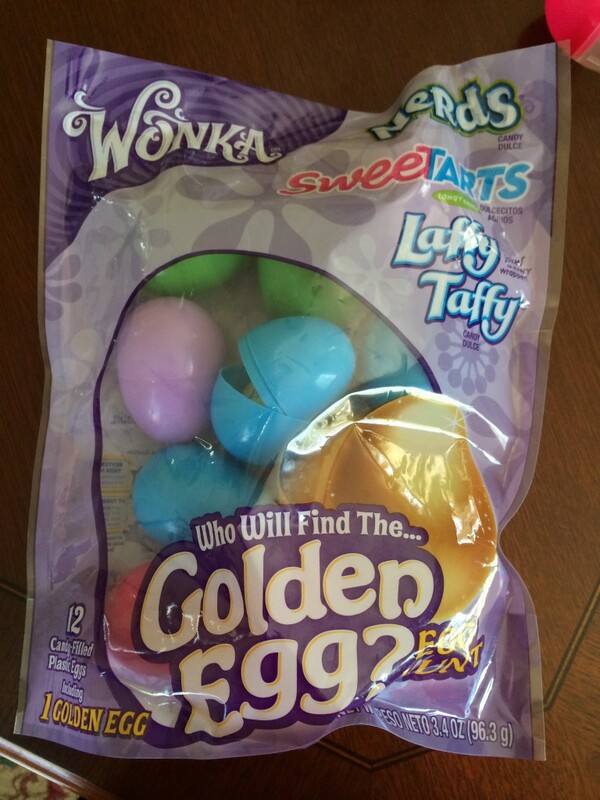 These fit perfectly into most plastic eggs. What are your favorite Easter Egg Hunt Ideas? 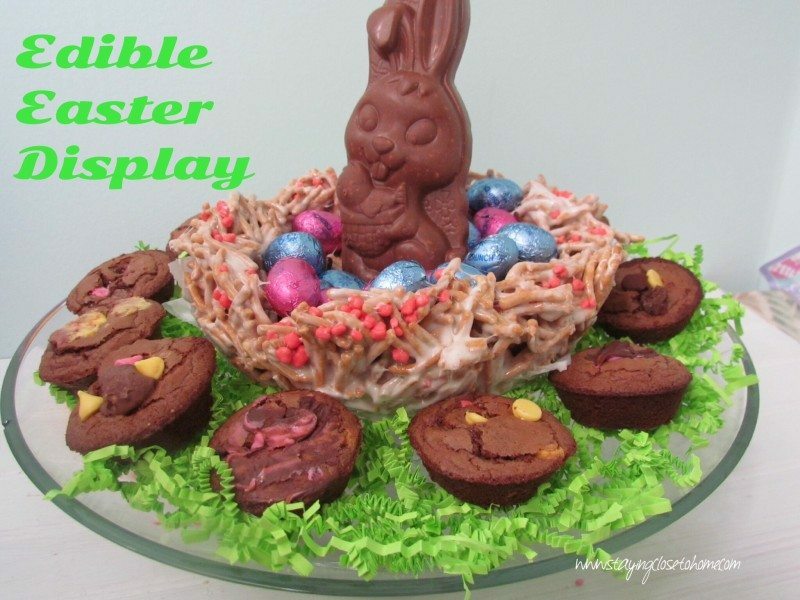 Check out these other Easter Centerpiece Ideas. The noodle nest is very cute – great centrepiece.